Today we will take a close look at the Best Fitness E1 Elliptical Trainer by Body Solid. Center drive ellipticals, such as this machine, are known for being some of the most popular pieces of fitness equipment on the market and a fine choice for working your arms and legs. You will find a center drive elliptical at almost every gym and you will almost always see them in use, owing to their great reputation among fitness enthusiasts. But nowadays, does everyone have the time to go to the gym whenever they want to exercise? Do we all want to go through the hassle of gym memberships and waiting our turn to using fitness equipment? You can easily avoid all these troubles by researching for the best elliptical for home use. We know that this process takes time as well, so we have decided to present one of the best fitness elliptical machines on the market, manufactured by the company with a similar name. 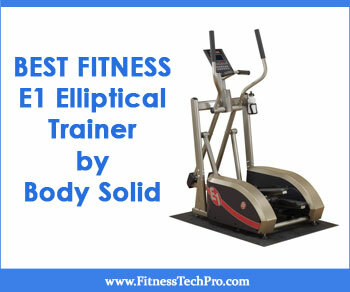 In this review, we will cover reports, ratings, pros, cons and more related to the Best Fitness E1 Elliptical Trainer by Body Solid, so you can see if it is the best elliptical for you. What is the Best Fitness E1 Elliptical Trainer by Body Solid? As the name suggests, the Best Fitness E1 Elliptical Trainer by Body Solid is an elliptical trainer designed to work for exercising at home. It has a very compact, sturdy and durable design that ensures it was built to last. It might not be the cheapest elliptical Amazon offers, but it certainly is one of the best ones you can buy. 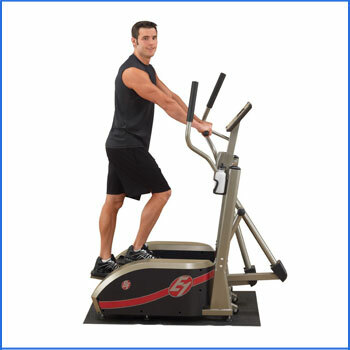 The Best Fitness E1 Elliptical is 48 inches long, 30 inches wide and 66 inches tall and was manufactured to be portable. This aspect is true, it is just that the Best Fitness E1 Elliptical Trainer is very heavy (215 pounds, to be precise) and might be a bit difficult to move. Nevertheless, it can be moved around with relative ease as long as you stay on the same floor. 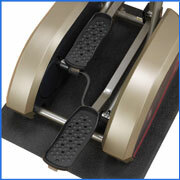 The Body Solid elliptical presents 17 levels of resistance so you can enjoy diversity to maximize elliptical workout. 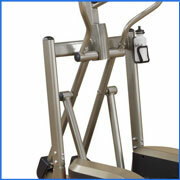 The product has a center elliptical drive design, as well as a resistant steel frame. With the Best Fitness E1 Elliptical Trainer by Body Solid you benefit from 12 workout programs and a well-built LCD display to access and work with the functions. The Body Solid Fitness trainer also provides contact heart rate handles, so all you have to do is grab them and your pulse will be monitored, in addition to other necessary data. To better understand the Body Solid Elliptical Trainer, let’s take a look at a complete list of its advantages and disadvantages. Where to Find the Best Fitness E1 Elliptical Trainer by Body Solid? As one of the top 50 best-selling Amazon ellipticals, we would definitely recommend that you look into this product on the platform here. This elliptical machine Amazon sells is currently $1,049 on the website, with a 40% discount from its original price. Nevertheless, you should always check the website for price updates, new discounts and offers. Body Solid elliptical reviews on this platform show that this is a great choice for a home elliptical trainer, with 54 out of 60 total reviews being positive. It is far more appreciated than the Best Fitness Cross Trainer, as the Best Fitness Cross Trainer Elliptical has an average rating of just 3.6 out of 5 stars. 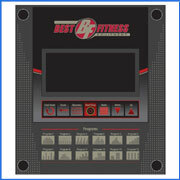 On Amazon, you can look into all the Best Fitness BFE1 reviews, see other Best Fitness prices and keep track of all the elliptical deals on this website. Furthermore, this Amazon elliptical trainer benefits from free shipping in the United States. While there is no particular best elliptical workout, Best fitness BFE1 elliptical trainer reviews point out that the machine is great for using an hour at a time while watching television. The most popular center drive elliptical reviews on Amazon clearly point out that this is one of the best advantages that the Best Fitness E1 Elliptical Trainer by Body Solid has, as opposed to competitors. You can experiment with the 17 resistance levels and 12 workout programs to see what Best Fitness E1 elliptical trainer by Body Solid works best for you. From time to time, some users mention that the nuts might need to be tightened if the machine starts making noise. If you clear up this aspect, your Best Fitness E1 elliptical trainer by Body Solid should work without being noisy (quiet enough to hear audio in the background). Also, for complete instructions on how to program the display, please look at the top customer review here. The Best Fitness E1 elliptical trainer by Body Solid does not require any accessories (as it already comes with an incorporated water bottle holder), but there is one certain product that you might want to take into consideration. If you do not want to damage your flooring or carpet, you can purchase a Stamina Fold-to-Fit Folding Equipment Mat (84-Inch by 36-Inch) for protection. Also, you can also get some grease if you find your product to be a bit noisier than you are comfortable with. We recommend the Permatex 81981 White Lithium Grease, 10.75 oz. Aerosol Can. However, please take caution in using your machine and try to avoid maintenance issues as much as you can, as many users have complained about Best Fitness’ poor customer service. Like we previously mentioned, one of the most significant complaints regarding the Best Fitness E1 elliptical trainer by Body Solid is the unsatisfactory customer assistance offered by the manufacturing company. Most negative Best Fitness elliptical reviews point this out as one of the main disadvantages with the product. Also, quite a few customers mentioned that the machine is really heavy and requires two individuals to carry around, but we would not necessarily consider this to be a problem that would influence your purchase. To put it in a nutshell, the Best Fitness E1 elliptical trainer by Body Solid is a great piece of fitness equipment that is worth the investment. It might not be as inexpensive as models from competitors, but the extra cash really goes a long way. We would recommend this elliptical to any individual who wants to get in more exercise at home while enjoying other entertaining activities.